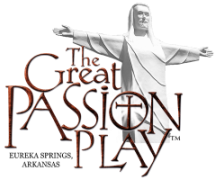 Noah's Ark Park is on the grounds of The Great Passion Play in Eureka Springs, Arkansas. Walk through the gates and get to see sheep, a pygmy goat, a dog, a llama, miniature horses, chickens, a giant rabbit, ducks, and more! Free admission with donations gratefully accepted to help feed and care for the animals. Donate to Feed the Play's ANIMALS by clicking the link. Any amount helps! It costs around $50 a day for the cost of feed for all of the Play's animals. We would greatly appreciate any amount you can give to help supplement the cost. We know our 3 camels, 7 horses, sheep, donkeys, and many birds would appreciate it too! The construction of Noah's Ark Park would not have been possible without the work of the following people: Team Effort Groups from 2016 and 2017, Mission Trip groups from the Passion Play spring and summer 2017, James Dean, Steve Garrison, Wayne Thompson, JP Dean, David Harris, Maddie Witte, Tim Hereen and maintenance crew at Passion Play, Phil West, Rob Wintercorn, Rob Robinson, Tom O'Hearns and work crew, And, we cannot forget to give thanks to Joe Smith who is the lead visionary and has been the head worker of Noah's Ark Park. Special thanks to Ney and Joyce Killebrew as well as Roger Glenn and his family Claud and Tonya Phillips for donations of animals.